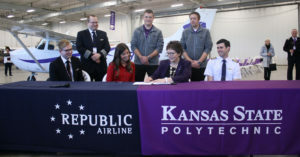 SALINA — Professional pilot students on the Kansas State University Polytechnic Campus have a new opportunity to directly connect with their industry and secure employment before graduation through a recently signed agreement with Republic Airline. Kansas State Polytechnic is now a partner in Republic Airline’s Aviation Career Pipeline Interview Program, which is designed to give future pilots a defined path from college to career.The program provides flight students an opportunity to interview for a first officer position with the Midwest-based regional carrier after earning their instrument certificate. Upon a successful interview, students receive a conditional job offer that is preserved as they continue to build the required flight hours and complete their degree. Students working on their instrument certificate typically achieve it as a freshman or sophomore, meaning, through Republic Airline’s Aviation Career Pipeline Interview Program, they could have a job lined up more than two years before graduating. Students hired for provisional employment with Republic Airline are called RJet Cadets and receive mentorship while they are still in school. In addition, when reaching flight training milestones, pilot students are given special apparel and gear and are invited to attend exclusive company events. After earning their degree and reaching the airline transport pilot minimums of 1,000 hours of flight time, cadets can officially commit to the regional carrier and begin employment as a first officer. Jacob Mitchell, a senior in the professional pilot program at Kansas State Polytechnic, has been both hired for a first officer position and selected as an ambassador for Republic Airline. While he says the company offers a variety of advantages, what has impressed him the most is its similarity to his school. As a Republic ambassador, Mitchell helps answer questions other students at Kansas State Polytechnic may have about the airline and works with those interested in employment by supporting their interview process and transition into the cadet program. Kansas State Polytechnic and Republic Airline participated in the Aviation Career Pipeline Interview Program signing April 7 at the school’s annual open house. To learn more about the professional pilot bachelor’s degree option at Kansas State Polytechnic, contact admissions at 785-826-2640 orpolytechnic@k-state.edu.